, a cele-. brated Latin critic, was born January 29, 1632, at Naumbourg, in Saxony; and, having laid a good foundation of classical learning in his own cpuntry, was sent to finish his education at Leipsic, under the professors Eivinus and Strauchius. 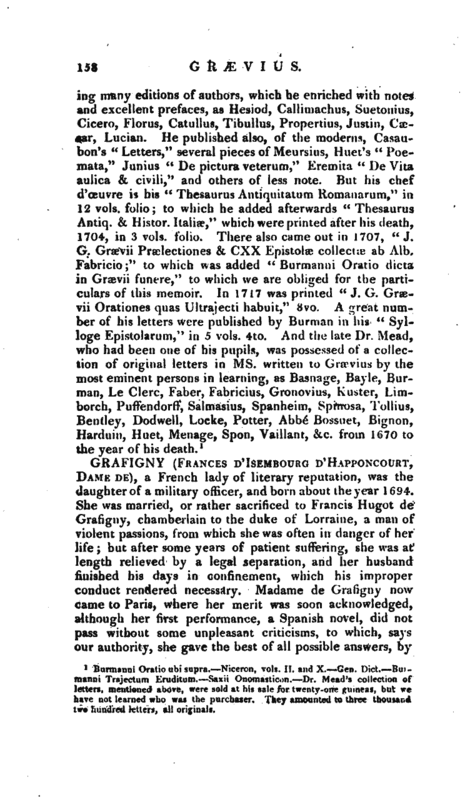 This last was his relation by the mother’s side, and sat opponent in the professor’s chair, when our author performed his exercise for his degree on which occasion he maintained a thesis, “De Moribus Germanorum.” - As his father designed to breed him to the law, he applied himself a while to that study, but not without devoting much of his time to polite literature, to which he was early attached, and which he afterwards made the sole object of his application. With this view he removed to Deventer in Holland, attended the lectures of John Francis Gronovius, whose frequent conversations and advice entirely fixed him in his resolution. He was indeed so much pleased with this professor, that he spent two years in these studies under his direction^, and frequently used to ascribe all his knowledge to his instructions. 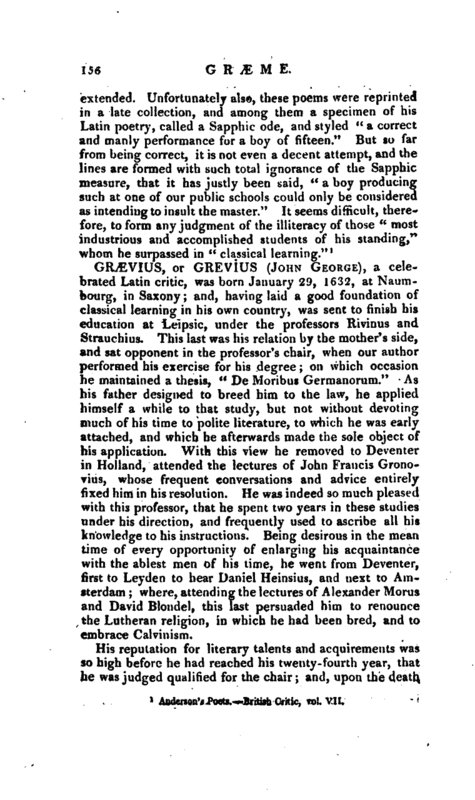 Being desirous in the mean time of every opportunity of enlarging his acquaintance with the ablest men of his time, he went from Deventer, first to Leyden to hear Daniel Heinsius, and next to Amsterdam; where, attending the lectures of Alexander Morus and David Blondel, this last persuaded him to renounce the Lutheran religion, in which he had been bred, and to embrace Calvinism. 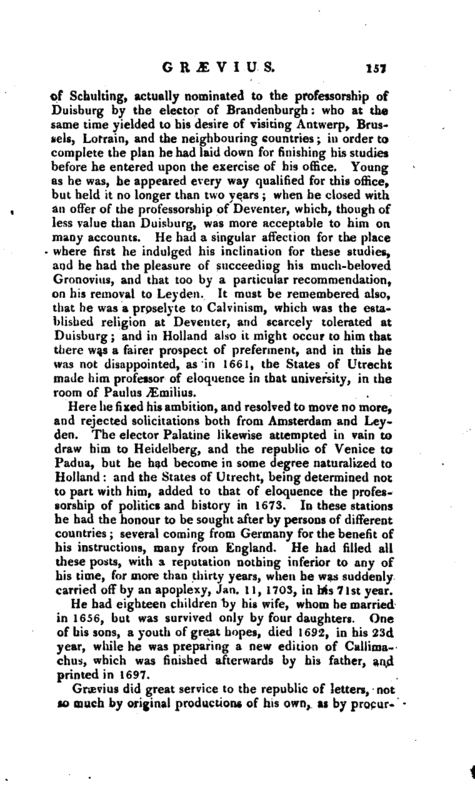 His reputation for literary talents and acquirements was so high before he had reached his twenty-fourth year, that he was judged qualified for the chair; and, upon the deatH | of Schulting, actually nominated to the professorship of Dnisburg by the elector of Brandenburgh: who at the same time yielded to his desire of visiting Antwerp, Brussels, Lorrain, and the neighbouring countries; in order to complete the plan he had laid down for finishing his studies before he entered upon the exercise of his office. Young as he was, he appeared every way qualified for this office, but held it no longer than two years; when he closed with an offer of the professorship of Deventer, which, though of less value than Duisburg, was more acceptable to him on many accounts. He had a singular affection for the place where first he indulged his inclination for these studies, and he had the pleasure of succeeding his much-beloved Gronovius, and that too by a particular recommendation, on his removal to Ley den. It must be remembered also, that he was a proselyte to Calvinism, which was the established religion at Deventer, and scarcely tolerated at Duisburg; and in Holland also it might occur to him that there was a fairer prospect of preferment, and in this he was not disappointed, as in 1661, the States of Utrecht made him professor of eloquence in that university, in the room of Paulus JEmilius. Here he fixed his ambition, and resolved to move no more, and rejected solicitations both from Amsterdam and Leyden. The elector Palatine likewise attempted in vain to draw him to Heidelberg, and the republic of Venice to Padua, but he had become in some degree naturalized to Holland: and the States of Utrecht, being determined not to part with him, added to that of eloquence the professorship of politics and history in 1673. In these stations he had the honour to be sought after by persons of different countries; several coming from Germany for the benefit of his instructions, many from England. He had filled all these posts, with a reputation nothing inferior to any of his time, for more than thirty years, when he was suddenly carried off by an apoplexy, Jan. 11, 1703, in his 71st year. He had eighteen children by his wife, whom he married in 1656, but was survived only by four daughters. One of his sons, a youth of great hopes, died 1692, in his 23d year, while he was preparing a new edition of Callimachus, which was finished afterwards by his father, and printed in 1697. Eurmanni Oratio ubi supra. Niceren, vols. II. and X. Gen. Dict. Bh:­manni Trajectum Eruditum. —Saxii Onomasticon. Dr. Mead’s collection of letters, mentioned above, were sold at his sale for twenty-one guineas, but we have not learned who was the purchaser. They amounted to three thousand two hundred letters, all originals.